Add a string tree to an Ashbory Bass for improved string pull and pressure at the nut. If strings tend to pop out of the nut while playing, or there is open string vibration at the nut - particularly when using strings made from harder, stiffer materials than the original silicone rubber (like the Aquila Thundergut) - this modification will provide a remedy. A certain minimal amount of string contact pressure is required across the nut for the instrument to play properly. The vertical and lateral angles at which the strings leave the nut are factors in establishing that. 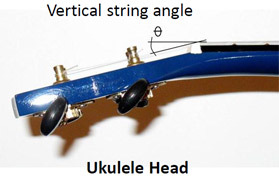 To provide more vertical pressure, the head on many stringed instruments are tilted back to increase the string angle. 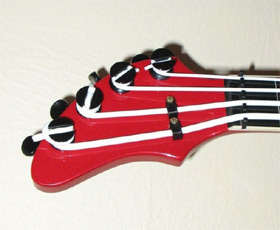 The head design of the Ashbory bass does not provide much vertical string angle and pressure on the nut, potentially causing vibration with stiffer strings. 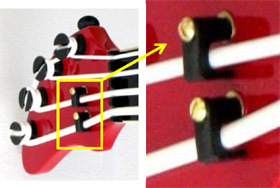 Also, the lateral string angle, particularly with the E-string, is much greater than for the other three strings. This angle puts more stress on the left side of the nut’s string slot instead of its bottom, and the string may pop out. 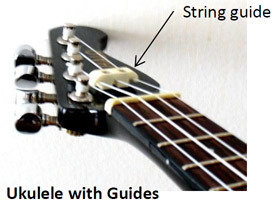 When the vertical angle of the string from the nut to the tuning machine is too small, some instrument manufacturers will install guides to increase that angle. Similarly, adding string guides to the Ashbory bass head will solve the problem. Important - This installation requires pre-drilling into the head of the instrument and driving screws. This should not be attempted by persons unskilled in using the necessary tools and fasteners, as extra care must be given to prevent cracking the heavily lacquered finish. The E and A-strings had the least tension and smallest vertical angles of the four strings. Hence, those were selected for adding guides. Readily available coaxial TV cable guides/clamps were selected in a size to accommodate the largest string. The supplied nails were replaced with wood screws and washers (to help protect the finish) for attachment. After the guides are installed, the resulting vertical string angle is greatly increased. Installing string guides between the nut and tuning machines on the Ashbory bass head will increase the vertical angle of those strings and apply more pressure at the nut. The result is to eliminate possible vibration while holding the strings in their slots.